Three Spartans had a great day in Clacton, and came back with prizes. JIM BROWN won first male veteran (65 plus) award for the half marathon in 1 hour 49 minutes 31 seconds. TIM SABAN was third man (50 plus) in 1:32:53. Tim was 25th and Jim 98th out of the 314 finishers. In the 10K ERICA GRAYSON took 57 seconds off her personal best (PB) with 55 minutes 53 seconds. She was second woman (45 plus). On a sunny day the race hugged the coast with much of it on the promenade with a stiff headwind slowing progress running south west towards the Martello Tower. BARRY OSBORNE ran 40:41 in Friday evening’s Ipswich Twilight 10K. The race was two laps around Ipswich city centre with 1500 entrants and lots of crowd support. He was second veteran 60 plus. THOMAS SAUKA ran the Royal Parks 10K in Hyde Park in 42 minutes 26 seconds. He was 43rd out of 619. Three Spartans spent the weekend in Edmonton for the 25th edition of the Edmonton Marathon. Edmonton is the Capital City of Alberta, a Province of Canada. The marathon course firstly went East following the Saskatchewan River, returning to the Downtown (City Centre) start at the halfway point. It was then out and back to the West, again returning to the Downtown area to finish. With a flat course and almost perfect running weather, it was a good day to take on a marathon. ROBERT HARDY completed the marathon in 5 hours 8 minutes 28 seconds and ROGER BIGGS in 5:25:31. PAULINE HARDY completed the half marathon in 3:05:10. On Sunday Spartan CAROL PAUL ran Leila’s Run from Wheathampstead. The race consisted of four hilly multi terrain laps totalling 26.95 miles. Carol completed the race in 4:46:18. The race was in memory of Leila Taylor who was a Garden City Runner and a 100 club member who died of cancer a couple of years ago. At Stevenage STUART HAYCROFT was the first Spartan home in 7th in 19:11. THOMAS SAUKA was 19th in 20:41. NICK GILL came in 21st in 20:47 and MARK BEASLEY was 57th in 22:55. CLIVE CANNON was 59th in 23:04 which is a new Parkrun PB (personal best). RYAN DUNNING (68th in 23:43), CHRIS HOLLAND (81st in 24:21), NEIL ROBINSON (83rd in 24:24), DANIEL SUTTON (91st in 25:02), DAVID SCOTT (100th in 25:440, JAMES SOUTH (154th in 29:31), JOHN WALSH (159th in 29:53) and IAN ALEXANDER (tailwalkig in 54:34) were the other Spartan men. The first Spartan woman home was JANA HAYCROFT in 127th in 27:21 followed by SALLY PHILLIPS 172nd in 30:36. Elsewhere HAZEL CLARK was 147th 27:30 in a PB at New Noggin. STEVE SMITHSON was 41st in 23:03 and MONICA SMITHSON 168th in 30:35, running at Panshanger for the first time where 259 ran. ASHLEY SCHOENWETTER was 4th in 20:52 at Barclay. 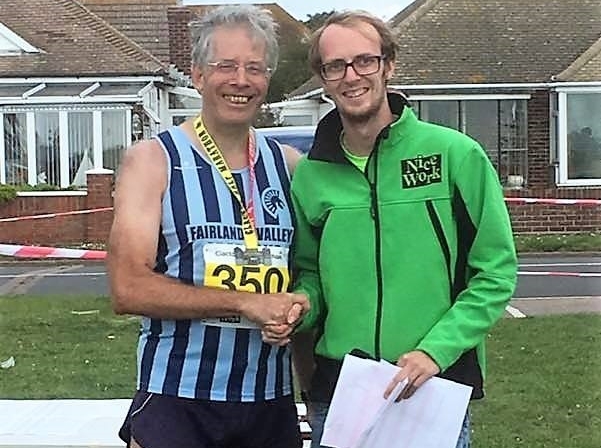 KEN JUDE was 31st in 22:36 at Ellenbrook Fields setting a personal best (PB). KAREN PALMER was 26th in 29:23 at the Haga Parkrun in Sweden.